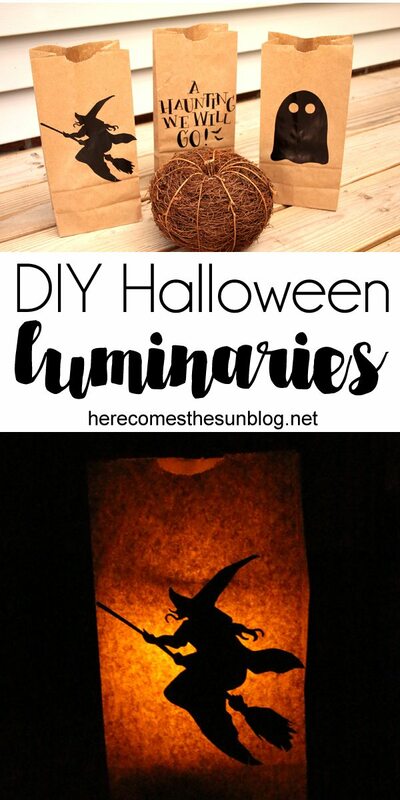 These Halloween paper bag luminaries are easy to make and look fantastic at night. 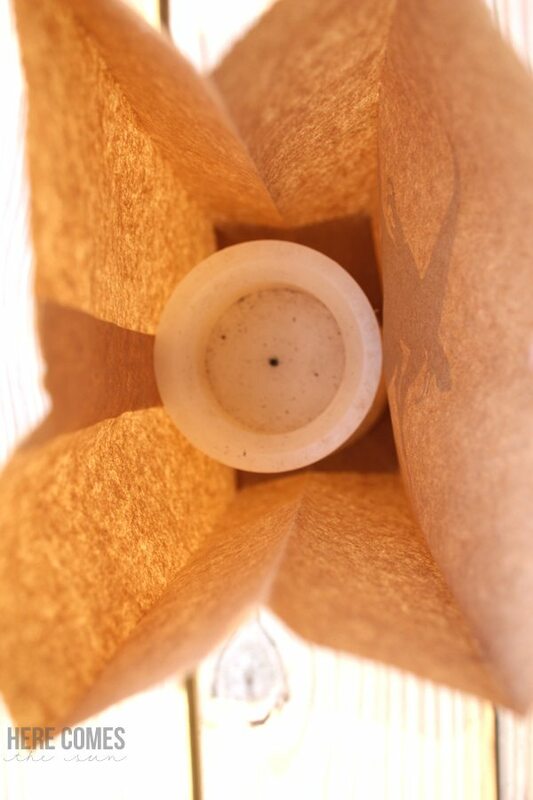 I’ve always wanted to make paper bag luminaries. Every year at Halloween I see them and think they are so beautiful. I tried a few methods and finally came up with the easiest way to make them. 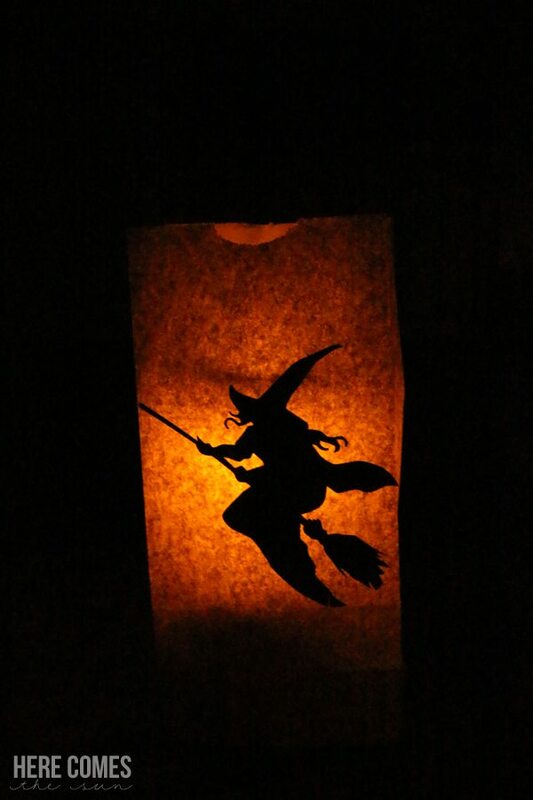 There are several ways you can make Halloween paper bag luminaries. Here are the methods that I tried and my observations on each one. Using your Silhouette or Cricut machine, cut the design directly into the paper bag. I tried this and did not have very much luck. The paper bag tore way too easily. I used a lunch bag. If you use a thicker bag, this method might work. Cut out a design using cardstock and tape it to the inside of your bag like in this post. I tried this way too and it just wasn’t working the way I wanted it to. Maybe it will work for you though. Cut your design out of vinyl and stick it to the front of the bag. Ding ding ding! We have a winner! The vinyl method is by far the easiest. Read on for detailed instructions. Please forgive my lack of photos for this process. Lately my only time to craft is at night which unfortunately doesn’t produce high quality photos. If you have any questions on the process please leave a comment. This is a pretty straight forward process though. First you’ll need to decide on a design. I got all my designs from the Silhouette store. I’m sure Cricut has similar designs as well. Or you could design your own. Next, load your vinyl into your cutting machine and choose the cut settings for vinyl. I set my blade depth at 2. If you need help using your Silhouette machine, I highly recommend taking a look at Silhouette School for tutorials. Cut out your design, weed out what you don’t need with a weeding tool and place some transfer tape over your design. If you have a simple design, you can get away without using transfer tape. I actually didn’t use any for this project, only because I didn’t have any on hand. The letters took a little time to get lined up without using tape but the other designs were easy. Center your design onto a paper bag. I used a standard lunch bag. Make sure you place your design on the side of the bag that doesn’t have the seam. If you place it on the seam side, you’ll have a dark line going through the middle of the design once you light it up. 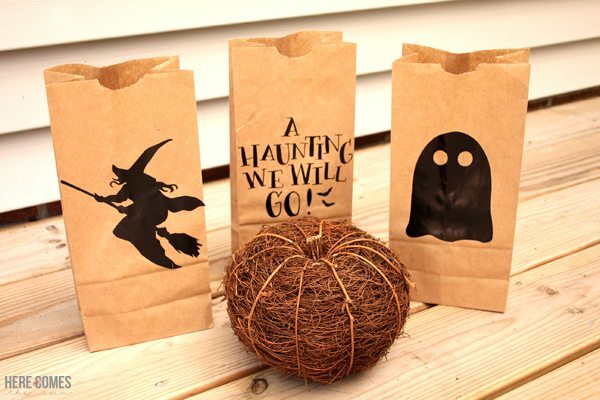 Now that your Halloween paper bag luminary is complete, you’ll need to put a flameless candle inside. First, I tried a tea light but found that it didn’t light up the whole design like I wanted it to. Then I tried a full size flameless candle and the result was way better. In order to fully light up the design, I had to place the candle a little higher in the bag. I placed the flameless candle on a votive candle to give it the height it needed. You can also use sand if you have it. 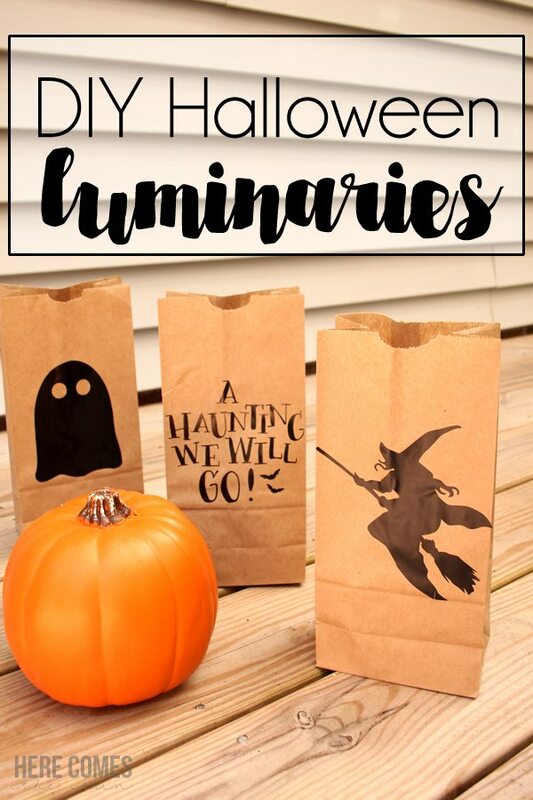 And there you go…easy Halloween paper bag luminaries. 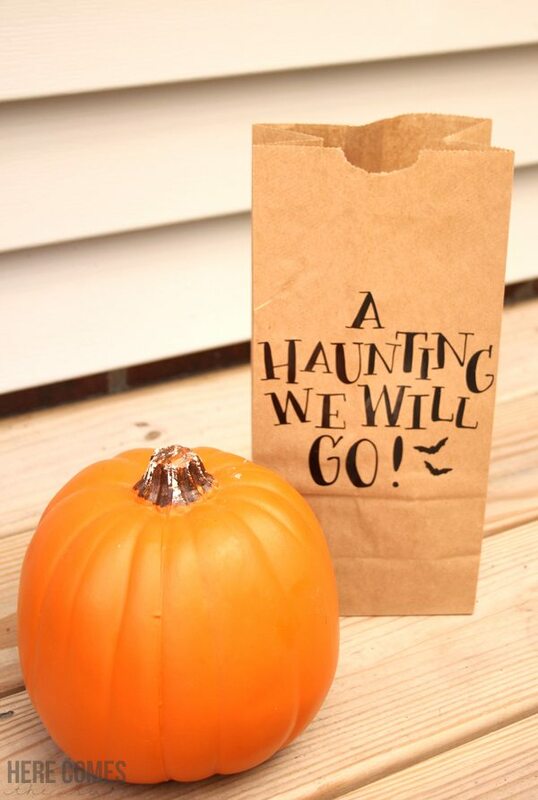 If you liked this post, be sure to check out my Ultimate List of Halloween Ideas. Click here to see all my Halloween projects and recipes.